Here we are on day 17 of Blogtoberfest. The native participants are seeming to be more slowed in their intensity… Sorry! I was drifting into being the David Attenborough of Blogtoberfest! *slaps self*. Today has been lovely. Lots of geekyness with my love and general relaxation. 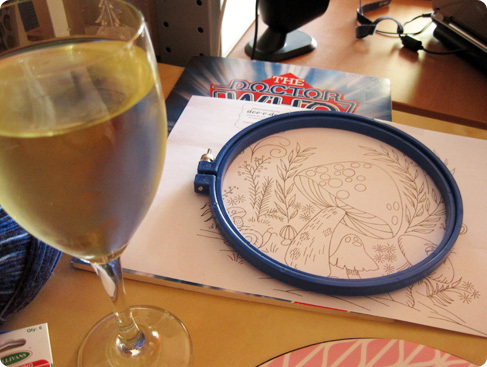 Some of today was spent browsing embroidery patterns online, and deciding on my next project. I have plans to make my own, very geeky, pattern. Probably SciFi based. But for now, while I am learning stitches, I have decided to embark on another pattern from online. This lovely one is from Doe-C-Doe, who has a tremendous amount of vintage patterns available online. You can see for yourself, here. I love mushrooms; both the visual aspects as well as the deliciousness of eating them. 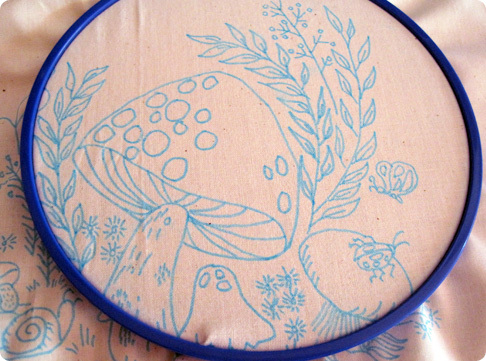 So mushrooms had to be an embroidery subject, sooner rather than later. I have the attention span of a flea, or a squirrel in a room full of nuts. So my latest craft obsession is embroidery. It’s not all short attention span, however, it is also partly based on the weather being warmer, and my seasonal lack of interest in wool. Embroidery has my eye now as it is cooler, and more portable. Well, at least around the house. So in my photos you can see my latest pattern selection, courtesy of Doe-C-Doe, my brand new pink keyboard with non-stickable keys thanks to my Husbitect, my fuel of choice (wine plus unpictured cheese & pate) plus my newly traced pattern in a hoop, ready to go. I am chuffed with my new air/water vanishing pen. It makes me feel more experienced. Ahem. * Today’s post was brought to you by Blake’s 7, Cliff Richard, Dean Martin, Doctor Who, Wine and Cheese. Plus the colour pink. Lovely embroidery- I can’t use those pens because I often forget to keep embroidering and the pattern disappears!! I have that Doctor Who book!!!!! Sounds like a great time was had by all!! Love that embroidery pattern..can’t wait to see the finished project. Oh thanks for sharing the link for the embroidery patterns. The one you have so reminds me of patterns my Grandma used to do in Hobbytex. Lol, love your ‘fuel’ of choice too. 2Paw – I was going to use the ‘air fade’ end but realised I would never get it finished before it faded. So far, the water fade is hold well. oh i’m looking forward to seeing this one finished! very sweet print.